Wheel of Sun and Moon is perfect. Exactly what I was looking for. I hadn't been looking at green hybrids. Finally I have a single deck that is capable of handling any deck I am likely to face at Phoenix. I will certainly be looking to draft a few cards from the new RNN release. I am a big fan of Tromple. And Spronghack. And I definitely want more spells. Just posted these on Reddit, Facebook, and Twitter, but I figured that people here might not see them there. I've typed up a number of Instant-speed tricks sheets for Shadows over Innistrad. The full set was spoiled today and I've gone through all the cards and noted down which ones your opponent/s could have in hand to surprise you with. All of them are presented in landscape format and half of them are for people with black and white only printers. SOI Instant-speed tricks sheet, colour. SOI Instant-speed tricks sheet, no colour. SOI Madness cards, no colour. SOI Instant-speed tricks and Madness cards, colour. For what it's worth, this is the sheet that I'll be printing and using myself at prerelease events. SOI Instant-speed tricks and Madness cards, no colour. Please remember that you can't refer to these sheets during your games but you can look at them between games and between rounds. If you have any questions, comments, or corrections then please feel free to reply. In particular, with prerelease events coming up next weekend, if there are any errors then I'd be very grateful if anyone would let me know so I can amend the sheets in time. Although, given that you're in Japan now, I suppose that's entirely legit. So did anyone else watch the Pro Tour this past weekend? - My Eldrazi deck is okay against non-aggro decks. ITs weakness is that a number of its mana sources are weak mana-dorks. Also has a little difficulty with flyers. - Vampires is a fun one to play, especially with Sideboards enabled. 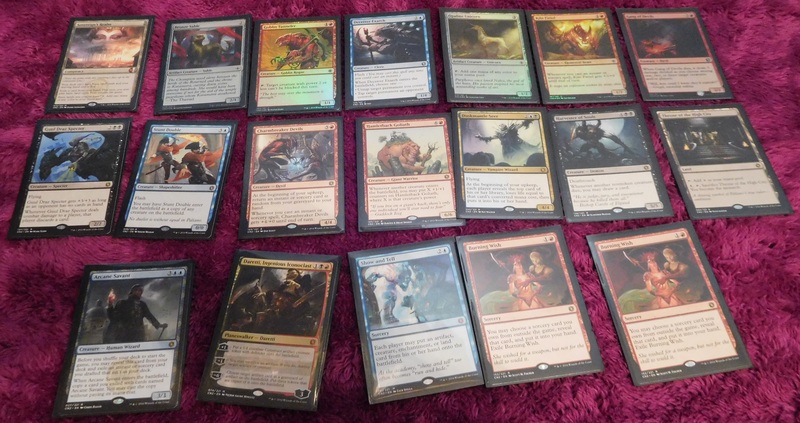 The Main Deck is Mardu, but doing a full Sideboard swap shifts it to Abzan. At present some of the Green cards in the sideboard may end up migrating to the G/B Sacrifice deck. - Sacrifice is intended to make use of any creature death, by it by my opponents doing, or my own. Presently its untested, so not sure how well it curves out. - G/W Tokens features both Nissa and Gideon, with Nahiri added for the red splash, who has shown to be very good at removal in a short test match. - Mono-blue Mill currently doesn't have much staying power. By that I mean I've lost by Life Total each game. I have slow-down creatures, but likely not enough card draw. Startled Awake, 3x Vessel of Paramnesia, and 3x Dreadwatersmake up the mill portion. 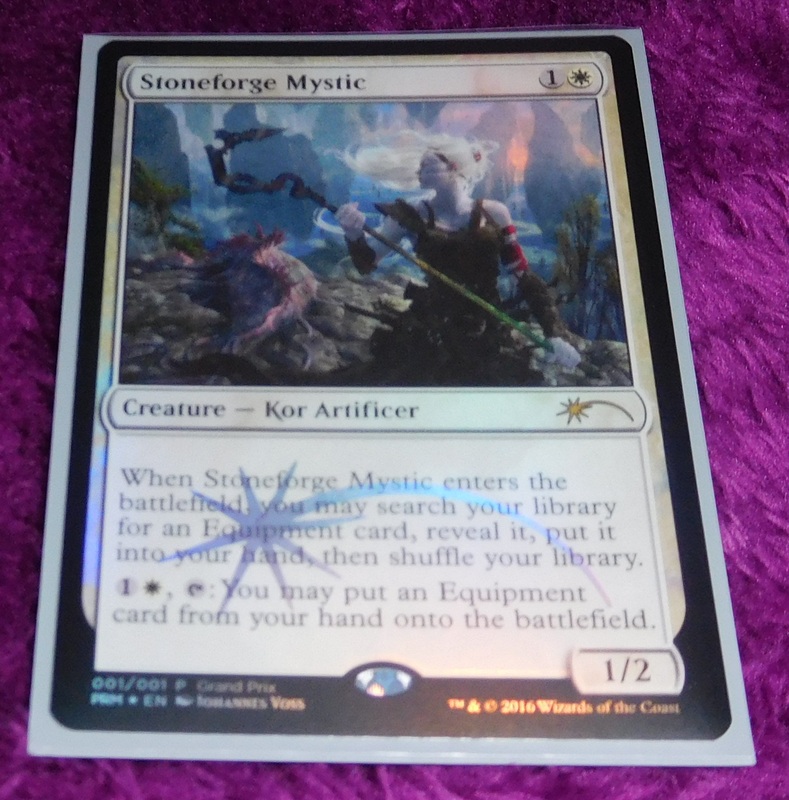 Also there is Jace, Unraveler of Mysteries to help with Card Draw. Anyone else been experimenting with the new cards from SOI as well? I did. I caught a bit of the action on Friday and Saturday and watched most of the matches on Sunday. Seemed quite good, to me. Yeah... That's not what sideboards are for, usually. You should use your sideboard to shore up the weaknesses in your deck and/or bring in specific hate cards against strategies that you know work well against you. Don't make a transformative sideboard just because you can. About the only times it's acceptable are when you're playing sealed (and thus the element of surprise works really well for you, not to mention that your limited card pool might have two relatively evenly-powered decks in it) or if you're playing a deck in one of the older formats that has a very specific strategy to win, and you change the strategy so that your opponent's sideboarding is far less effective. Mill isn't really a strategy in the current Standard environment. At best it's a win condition in a slow control deck (through Sphinx's Tutelage) but it's not something that you should be including all of those cards for. Not really. I've been too divorced from the Standard scene for around 2 years now, when my gaming group in Japan started to break up due to people moving away. I've not kept up to date with buying cards and certainly not kept up to date with buying them. So last weekend I went to GP London. We only really get 2 Grands Prix a year in the UK, with GP Manchester back in May being Constructed Standard and this one being Limited Kaladesh. I had an absolutely fantastic time. I only went 2-3-1 in the main event before I dropped but I did a lot of side events, including three Chaos Drafts and all three Conspiracy 2 drafts (Friday and Saturday at 7pm and Sunday at 6pm). My best moment of the weekend happened during the main event itself. It was game 2 of match 1 and I'd won the first round. The battlefield was clogged up with a whole bunch of creatures on the ground, so neither of us could attack. I'd cast a Cloudblazer a couple of turns earlier so I was starting to break the deadlock, and I also had a Torrential Gearhulk that I'd Flashed in a few turns before that to eat an attacker. My opponent cast Revoke Privilege on the Cloudblazer to stop it from attacking. In his End Step I cast the Acrobatic Maneuver that I'd sideboarded in for game 2, targeting the Gearhulk. I flickered the Gearhulk, drew a card off of the Acrobatic Maneuver, and put it into the Graveyard. I put the Gearhulk's ETB trigger onto the stack, targeting the now-in-Graveyard Acrobatic Maneuver, and cast it (without paying its mana cost) targeting the Cloudblazer. The Cloudblazer went to exile, the opponent's Revoke Privilege went to his Graveyard, then the Cloudblazer returned to the battlefield. I drew another card off of the Acrobatic Maneuver and exiled it. Then, I put the Cloudblazer's ETB trigger onto the stack and resolved it. When all was said and done, I'd drawn 4 cards, gained 2 life, and blanked one of my opponent's best pieces of removal for the cost of 2W and a card. My neighbour said, "I have no idea what you're doing, but I like the sound of it." Upon telling the story to a friend later in the day, he said, "I didn't realise they'd reprinted Sphinx's Revelation in Kaladesh." This was the best value play that I've ever made, and I doubt I'll ever get to make a play with as much value ever again. In terms of what I came away from the event with, here's my haul. 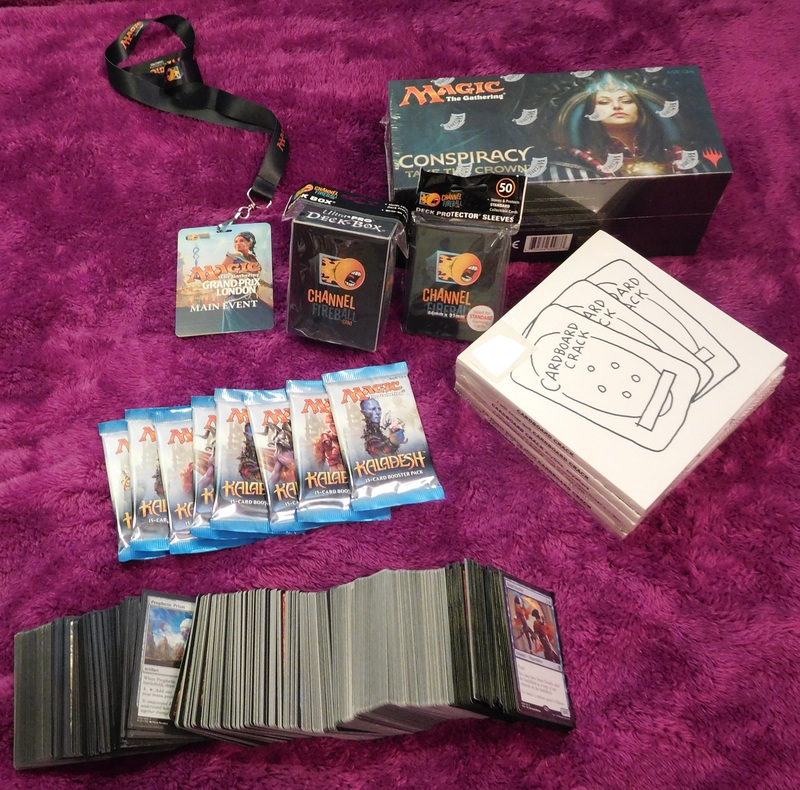 The box of Conspiracy and the 8 packs of Kaladesh were what I got off of the Prize Wall or traded for using the proceeds of my Prize Wall winnings, whilst I bought the Cardboard Crack 6-book set myself, and the deckbox and the sleeves were as part of the event entry. I seem to have missed out on taking a photo of the GP playmat, but you can see that here if you'd like. In terms of the big block of cards at the bottom of the screen, I've taken a few more photos of them. Here are my pulls from my Chaos Drafts, with the Caustic Hound, Vines of Vastwood, Vedalken Archmage, and Eye of Ugin all in foil (and the Grim Reminder being what I was passed as the final pick on a pack at one point); the Fire-Lit Thicket is my first ever "filter" land that I've ever pulled or even owned, so that made me pretty happy. 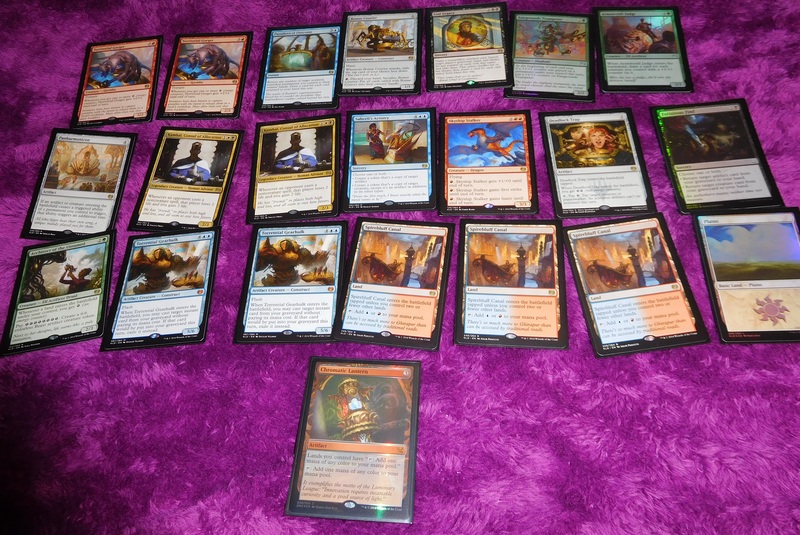 Here are my pulls from my three Conspiracy 2 drafts, with the Bronze Sable (along with its two non-foil brothers all having Firebreathing from Incendiary Dissent and "Deal combat damage to a player, pay U to draw a card" from Hired Heist), Goblin Tunneler, Opaline Unicorn, Kiln Fiend, and Gang of Devils all in foil; the Sovereign's Realm was my pack-1-pick-1 in the Friday night draft, and I proceeded to draft Removal.dek including three Garbage Fires on 3, 4, and 7 (all in pack 2) but the Duskmantle Seer ended up being my downfall (as I was on 6 life and revealed my only 6-drop, the Harvester of Souls). Here's the event promo which I'm quite pleased to finally get a copy of. And finally, here are my Kaladesh pulls across the whole weekend, with the Fairgrounds Trumpeter, Armorcraft Judge, Fortuitous Find, and Plains all being foil. 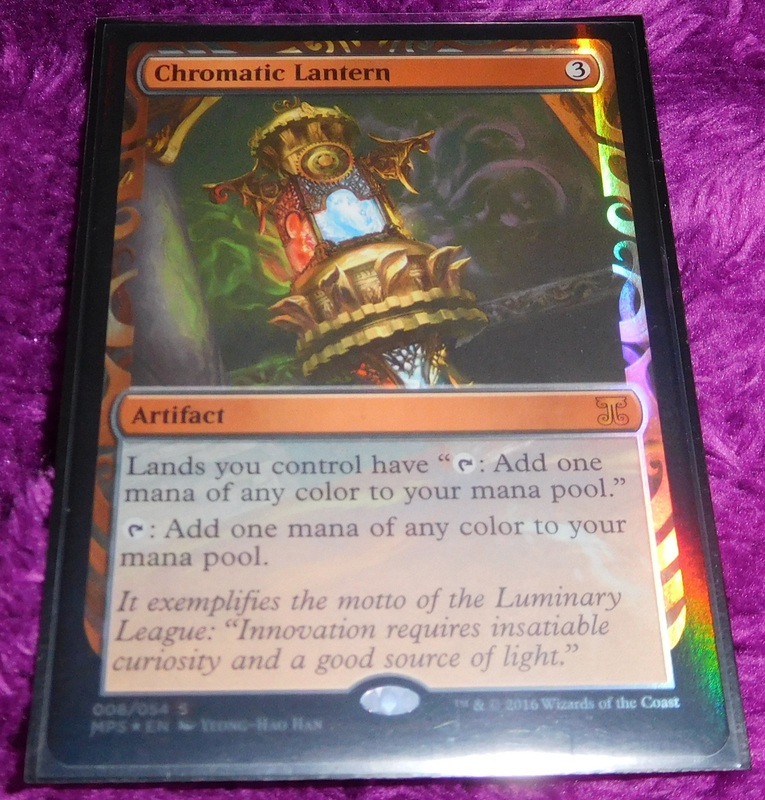 Why, yes, that is a Masterpiece Chromatic Lantern, that I actually got in my main event pool (and as it's the first ever Expedition or Masterpiece I've ever pulled, I'm extremely happy with it). Overall I had a great time. Anyone who's never been to a GP before should try it as, at the worst, it's like a Magic convention (similar to a GW Games Day) where you can talk about, and play, Magic with loads of people you've never met before.